← Perks Turns 1- Happy 1st Birthday! If you were to ask any of my family members if I’m better at cooking or baking the answer would probably unanimously be…cooking. I am fortunate that even though I lack of large number of baking skills, I’m able to pull off one made from scratch cake. 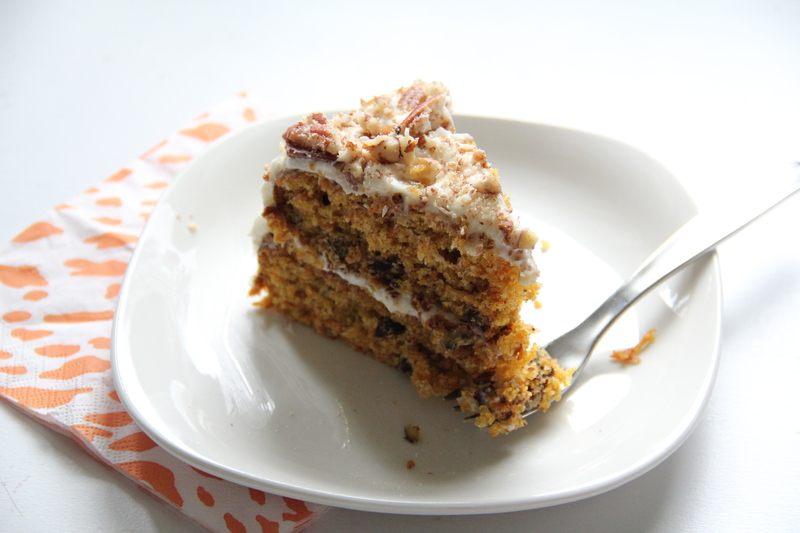 It’s a simple carrot cake that I stumbled upon a few years ago flipping through a Real Simple magazine. 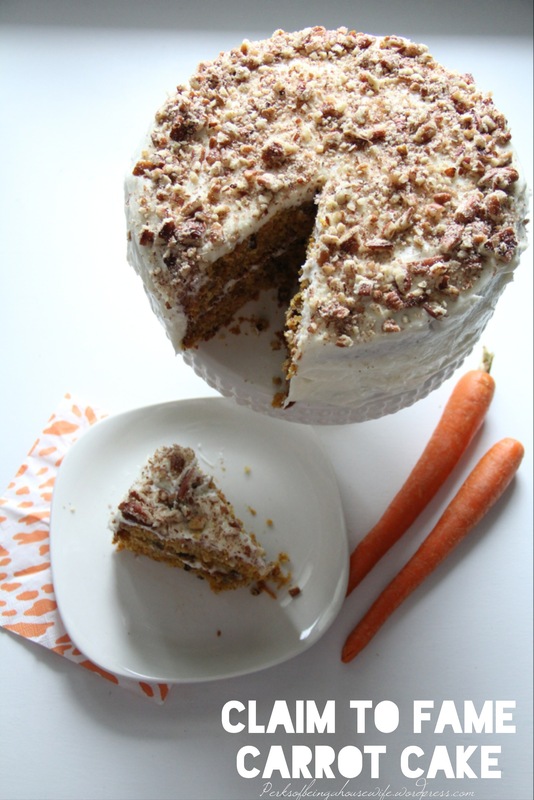 I first made it for Easter since for whatever reason I associate carrot cake with that holiday primarily. Since then, it has now become my most requested thing to make for our little brother Jordan. It was finals week for him and he begged me to make him one to get him through the hours of studying and test taking. 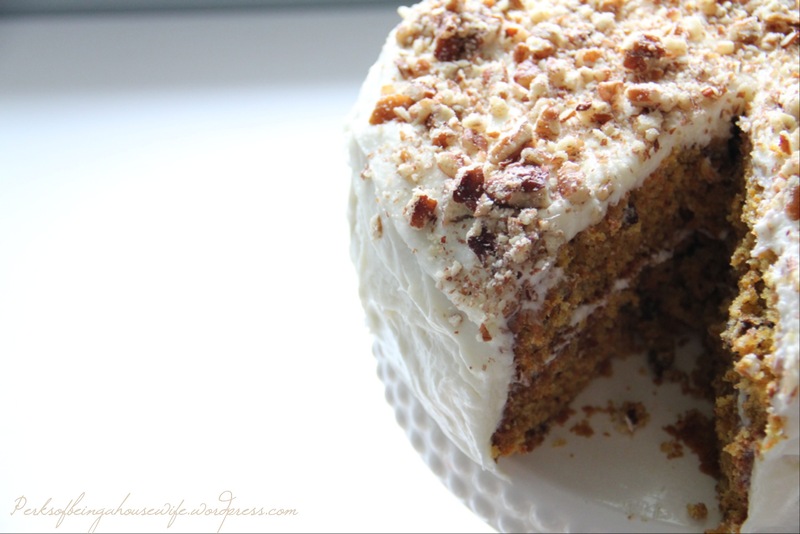 In honor of Jordan, I give you my claim to fame carrot cake! 1. Preheat the oven to 350 degrees. Butter two round 8 inch cake pans and line them with parchment paper on the bottom. Butter them again on top of the paper and dust the entire pans with flour. 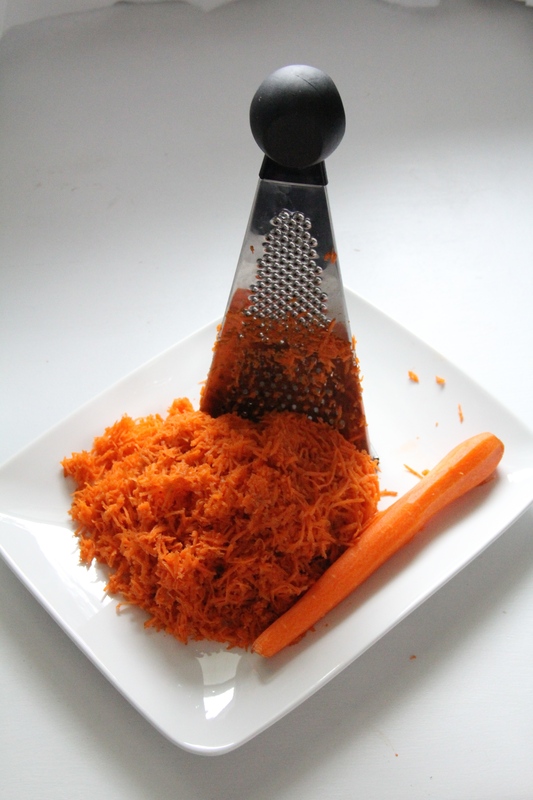 Grate the carrots with a hand grater and set aside. 2. 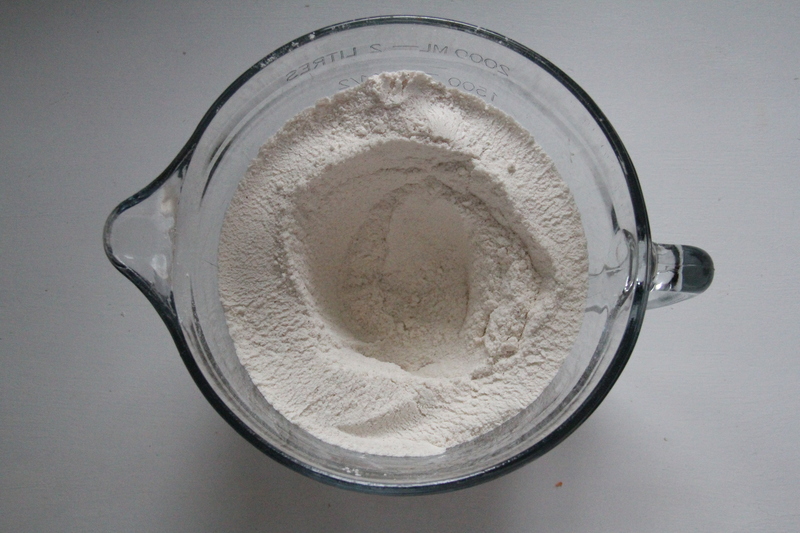 Combine flour, sugar, baking soda, baking powder, salt and pumpkin pie spice in a large bowl. Make a well in the mixture and pour the melted butter, eggs and sour cream in it. Mix well. 3. Add in the grated carrots and pecans. Pour into the prepared pans. Bake for 40-45 minutes, rotating the pans half way through. The cake is done when the center comes out clean when poked with a toothpick. Allow the cake to cool in the pans for 15 minutes before transferring to a drying rack to completely cool. 4. 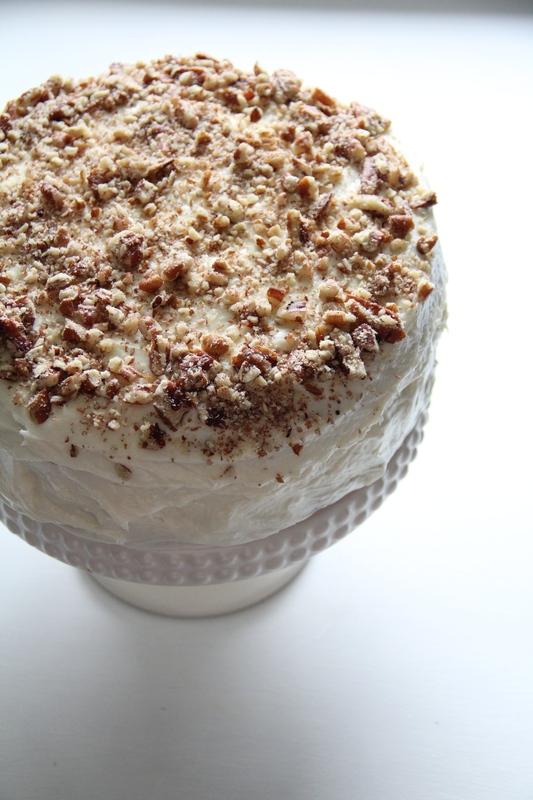 While the cake is cooling, whip up a batch of cream cheese frosting. (My favorite part). 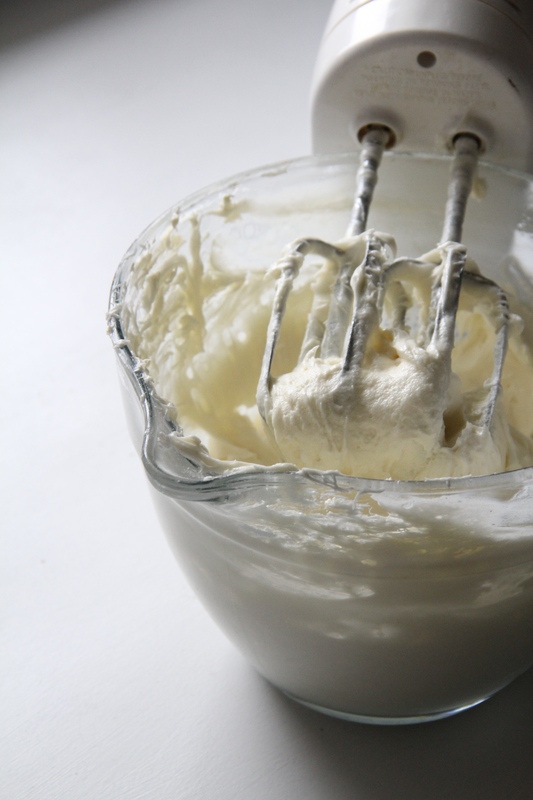 Use electric mixer to beat the butter and cream cheese on high for 2-3 minutes. The mixture should be light and fluffy. Reduce the speed to low and add in the sugar, then the vanilla and salt. Mix until smooth. 5. Invert one of the cooled cakes on a serving plate and spread a layer of frosting on the top. Place the other cake on top and finish by frosting the entire cake’s top and sides. 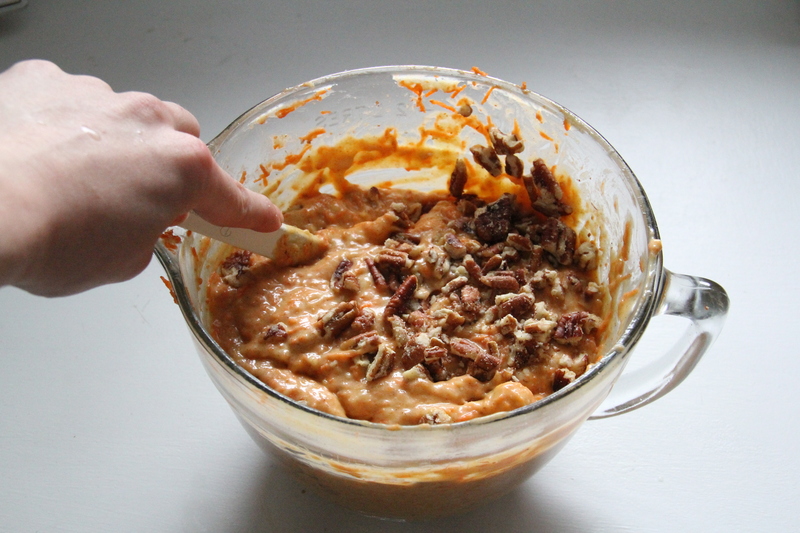 Garnish the top with the remaining chopped pecans. Things are best when shared, so make sure to spread the love if you end up making this cake. And remember that everything tastes better when it’s made with love. This week the cake had a special dash for our brother Jordan. Congrats on getting through college this year! We love you!